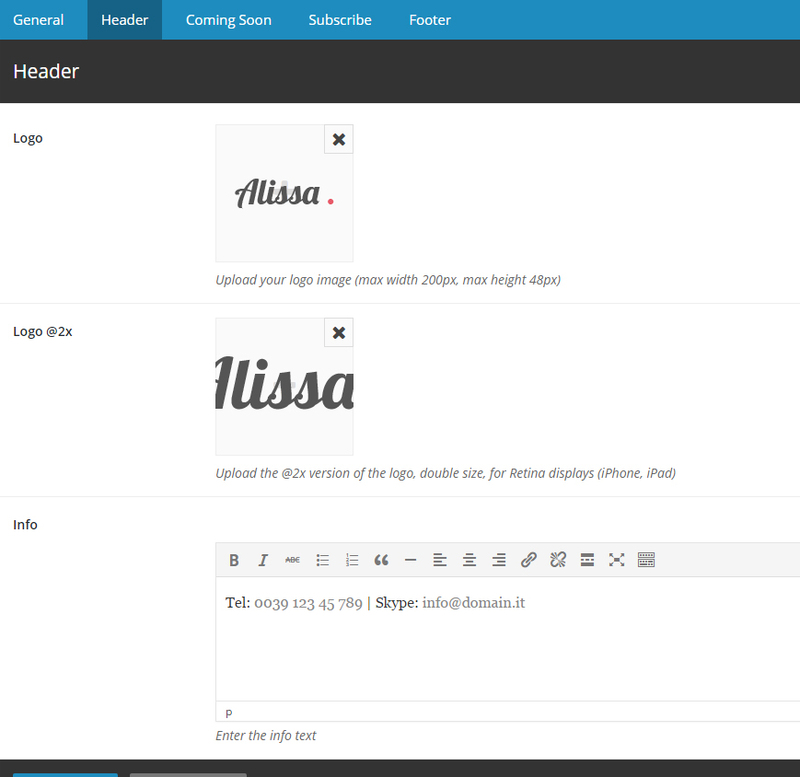 Today I’m going to present you the WordPress version of the Alissa Bootstrap Coming Soon Template. 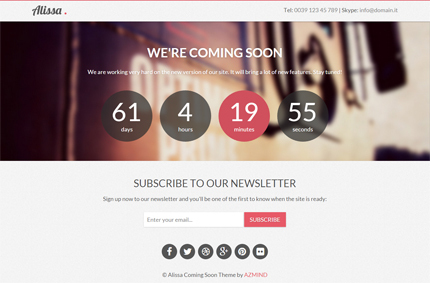 After its release, back in 2013, Alissa has become one of the most popular free templates here on Azmind and its page is one of the most visited of this site. This WordPress version comes with all the features of the HTML version and also offers some new ones as you’ll see below. But the most important thing is the possibility to create a WordPress Coming Soon Page without touching a line of code. You can do it easily from the Alissa Options Page. Below you can find the live preview link, the purchase link, the list of features and a review of the Options Page. * “Set Up” means that after the purchase you send me an email with your text, logo, etc. I install the theme in your WordPress site (you give me the credentials; you change them later) and I set it up according to your instructions. I’ll assume that you already know how to install and activate a WordPress theme. If not, just let me know. 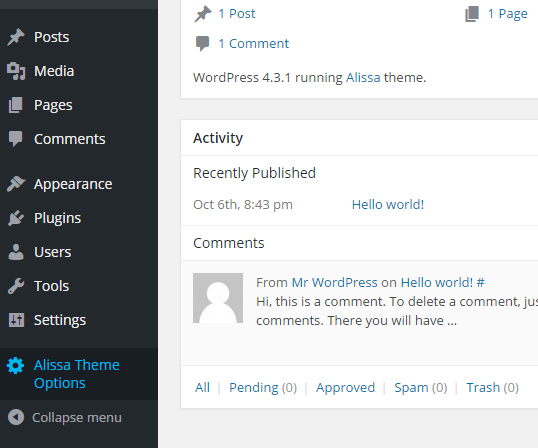 To access the Alissa Options page just click on the “Alissa Theme Options” item in the left menu inside the WordPress Admin panel. Here you can set up the header part of the page, including the logo and the info section on the right where you can show your phone number, skype name, etc. 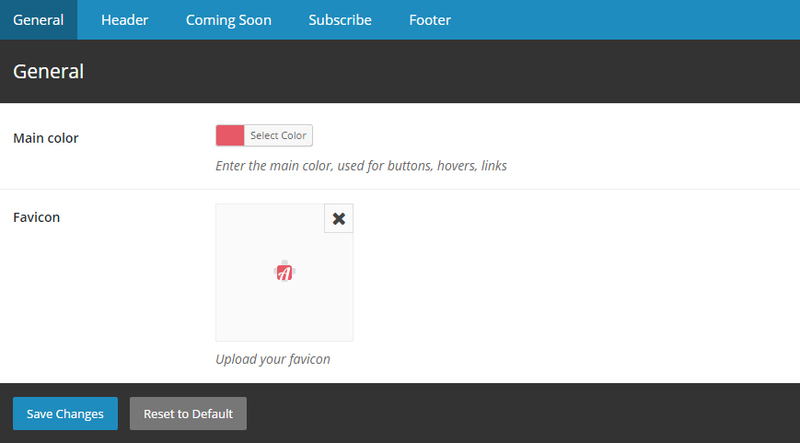 In this tab you can set up the coming soon section of the page. 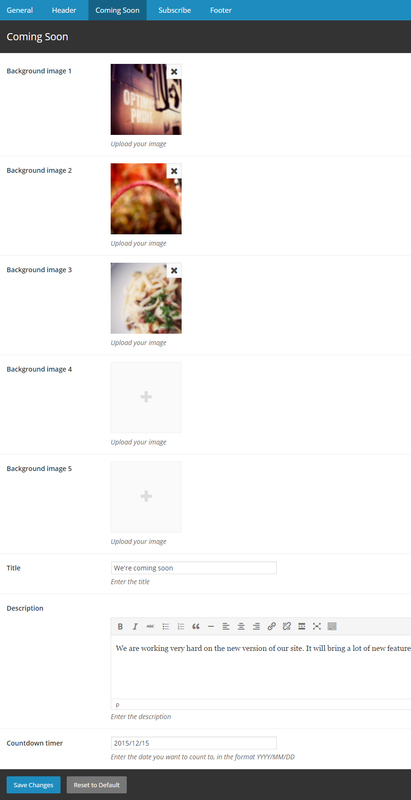 You can upload the images for the background slideshow (up to 5 images), enter the title, the description and set up the countdown timer. 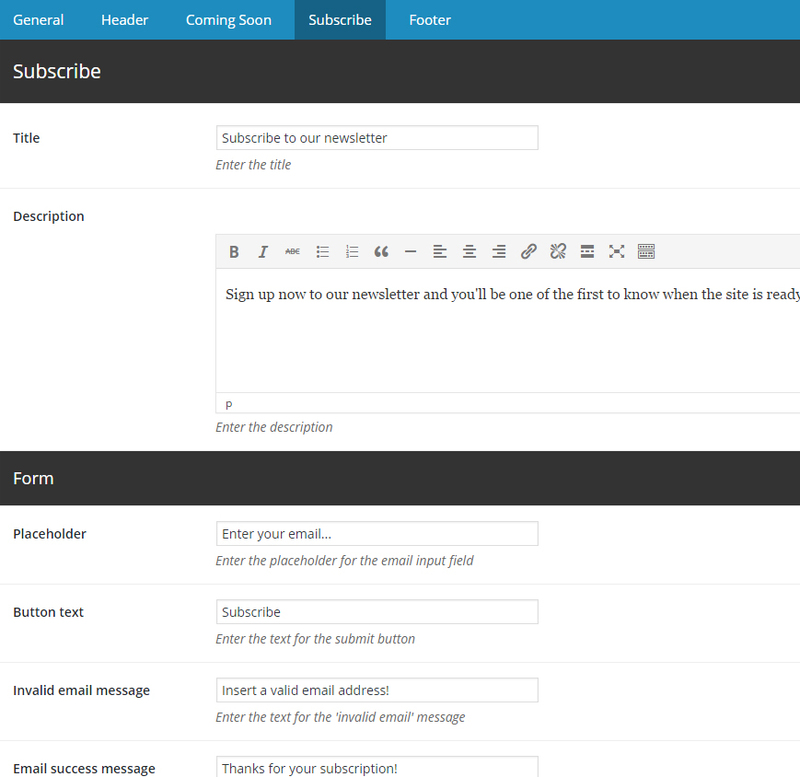 From the Subscribe tab you can set up the AJAX email subscription form. You can choose to receive the new subscriber in your email or add it in your MailChimp list. 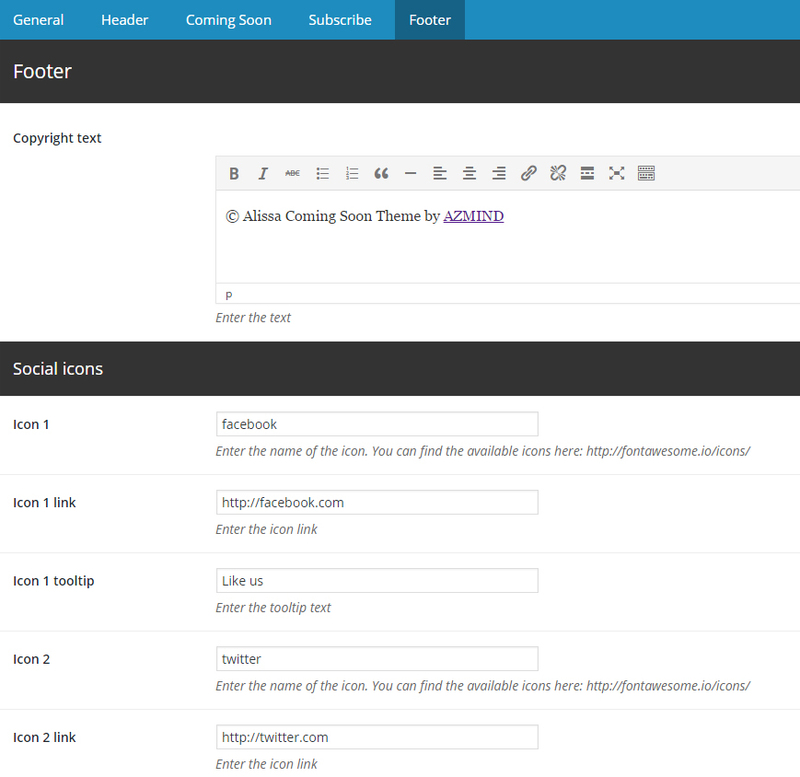 Here you can enter the copyright text and set up the social icons. You can add up to 6 icons with links and tooltips. That’s all. I hope you like this theme and find it useful for your projects! If you have any question, suggestion or you just want to say “Hello”, please leave a comment in the form below. I need help installing. I click the subfolder “Alissa-theme” but I can’t install that since it has multiple folders. Which exact file installs the theme? You have to compress (.zip) the subfolder “alissa-theme” and upload it from your WordPress admin panel. Contact me here contact.azmind@gmail.com if you have problems installing it. I’m very Impressed with this theme and I would like to use it for my page. However I have a small question before I go on : Is it compatible with ConvertKit? I’m glad you like the theme. The current version is not compatible with ConvertKit. Maybe the future versions. Since the theme is not compatible withConvertKit and we do not have Mailchimp. If we keep the ‘newsletter form’ as it is, do I understand it correctly, that we will just be able to set it up in a way so that we get an e-mail to our inbox whenever we have a new subscriber. Is that possible? So we can manually transfer the new subscribers to our ConvertKit? I’d appreciate a quick answer! THANK YOU! Yes, you can choose from the Admin panel if you want to save the email addresses in your MailChimp list, or just receive them to your inbox every time you have a new subscriber.